Does anyone have any information on the relative popularity of different hilt types among different peoples during the migration period? Is a preference for type identifiable to specific tribes or geographic areas? From the limited resources I've been able to find on the web, for instance, most of the type III (Oakeshott/Behmer... I believe this is type V under Behmer's original system) finds seem to be in Denmark, and type IV (again, Oakeshott/Behmer) seems strongly associated with Vendel culture, but I've no idea if this is reflective of actual distribution or not. I've found a lot of lovely pictures (some of the best being some type III's posted by Kirk Spencer over at sword forum) but not nearly as much information as I'd like. My resources are very limited at the moment, and I'd love any recommendations on books I should look into. I ran across this old thread today. I remember seeing it before and thought that I should try to build a chart showing Behmer's real typology. So many have seen Oakeshotte's simplified "Behmer" typology and assumed this was in some way Behmer's classification. Five years later I am in the process of building a chart that would show a better representation of Behmer's classification. This chart also includes some basic information on chronology and geography. It has been an off-and-on project over the last couple of years. And considering that it might be years before I ever finish--I have lots of projects but rarely ever finish one--I thought I post it (as it is) on this old thread. I intend on getting it completed some day... The version attached here is a work in progress. However, it should give a better idea of Behmer types. If anyone sees any errors, let me know. Really nice work as always. Not an error, but the only thing I'm missing is some information on blades and scabbards, since these were a substantial part of Behmer's typology. Nevertheless, your chart really helps to make a complex typology more accessible, also to those who have the book, but don't read German. Behmer does link various sword types to various tribes, but my personal opinion is that this is a less useful part of the work. During the migration period people/tribes obviously moved around a lot, and their location is only mentioned by a few sources. So if, let's say a source from 480 A.D. says that tribe A lived in location B, that does not mean that somebody buried in 520 A.D. in location B was actually a member of tribe A. And because the sample size of various types sometimes consists of less than 10 swords from one country, let alone tribal area, I think that drawing any definitive conclusions is a bit doubtful. Goods / weapons also moved around a lot, whether connected to people or not. 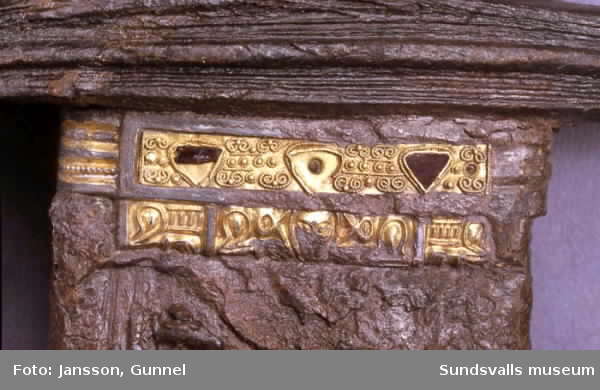 For instance, the famous Sutton Hoo sword is closely linked in decorative style to some of the Vendel swords. 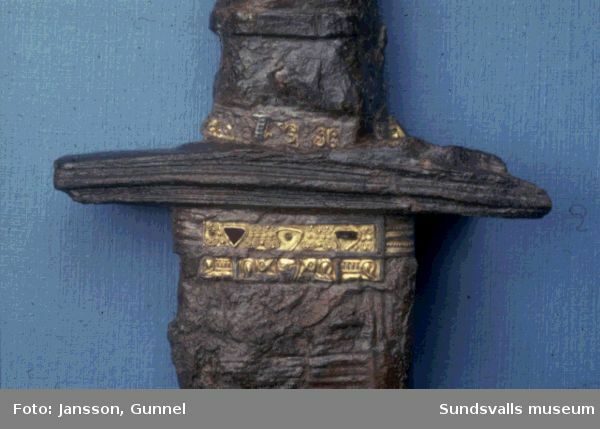 Yet we know that this sword belonged to a Saxon king, not a Vendel who traveled to Britain. thanks for the regional breakdown, it'll help me too EVENTUALLY finish the composite hilt i started years ago! Nevertheless, your chart really helps to make a complex typology more accessible, also to those who have the book, but don't read German. Maybe bad form to quote myself, but I'd like to correct myself and say that it's useful for everyone, just to have a quick overview. In fact, I just printed it and put it in the front of my copy. Just one remark, the dating of each type requires really careful reading. I like to pretend that my German is quite good, but I have to read the entire section a couple of times before I get a clear idea of the dating. Anyway, my reading from the section on Type I suggest a time-frame from 2nd. half of the 3rd C. until the end of the 6th or early 7th. C. for the Cumberland sword. First of all let me just say thank you for making this chart. I've always wanted a look at the original Behmer typology and not just Oakeshott's simplification of it. That being said I was just re-reading Oakeshott's Archaeology and I seen that there was a type II, with silver plated hilt, found in Thorsbjerg bog which dates to between 60 - 200 AD. This would place this type earlier than the above chart has it. The above mentioned type I found at Cumberland with filigree and garnet decoration is also mentioned in Oakeshott but there is no picture. If you happen to have any pictures of this sword (and the Thorsbjerg one also) I would be very greatful if you could share them. Thank in advance. The above mentioned type I found at Cumberland with filigree and garnet decoration is also mentioned in Oakeshott but there is no picture. From The Sword in Anglo-Saxon England, by H.R. Ellis Davidson. Hey Paul thanks for that. I've actually seen this sword in a plate of Osprey's Anglo Saxon Theign. If you've seen this what do you think of their version of it? Ok time for another question, in the type I section of the above chart there is a line drawing of a sword could someone here tell me anything about this e.g. where it was found etc. The image is from "Das Schwert im Fruhen Mittelalter" by Wilfried Menghin. It was found in Sudsvall Sweden. Hey Kirk, thanks. Do you happen to have any more info about this hilt e.g. date, material its made from, etc? Or better yet a colour picture, if you don't it's ok as knowing where it was found is very helpful, thanks again. Sorry for not replying sooner, but I'm not so keen on the drawing. I think the "pommel" that they drew shouldn't be there. It should be just the upper guard, which is a slab of wood, with maybe a peen block, but no pommel cap, as far as I know. Also the metal inlays on the Cumberland sword are shown as metal bands, which is not correct. 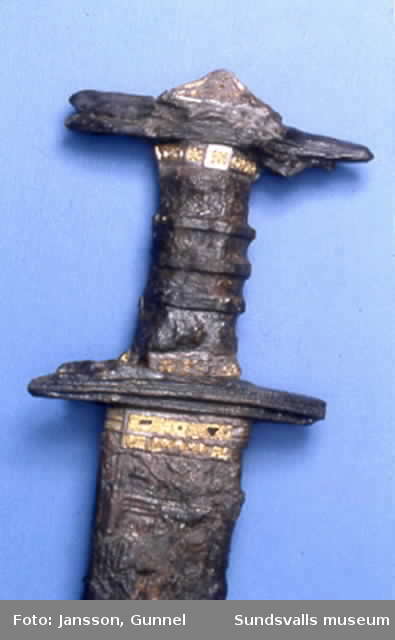 As a representation of what a "British"/Late Roman Migration Age sword may have looked, then maybe Osprey's drawing is not so bad, with exception of the "pommel", but still given the limited amount of swords found from that period and area, I think it would be wiser to stay as close to the Cumberland sword as possible. I couldn't find the sword in the catalog. Do you have a catalog or page number? Sorry I'm so late responding. I somehow missed the post. Pictures of the Hogom/Sundersvall sword. Horn or antler hilt and guards with gilded silver scabbard and hilt fittings. Gold filgree and garnet work on the scabbard mouthband. Some nice foundation moulding and tooled decoration on the scabbard. Nice little silver gilt pommel cap too, which I'd say dates it to the sixth century; it's a feature you don't see on earlier Behmer Type 1. WOW thanks Mat for the pics, really appreciate it. I agree about sixth century date.